This documentary presents, for the very first time, an ensemble of colour images filmed in France during the course of the Second World War. From German occupation and the harsh reality of civilian daily life during this greatly troubled period to army exercises in North Africa and Great Britain as the Allies prepared for the liberation this film documents the streets, the cafes and the daily life of ordinary civilians. 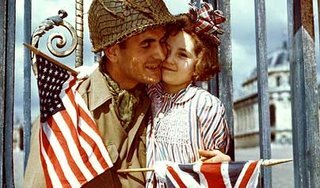 Covering the joyous scenes of liberation - where soldiers, GI's, civilians, and even some celebrities celebrate the Allied victory - from Hemingway to Clark Gable, passing by Edward G Robinson. Also included are the horrors of the war and the bodies discovered at Daschau: shocking images that are revealed for the first time. Enriched with memories from some of the last remaining witnesses of the Liberation, these fragments uncovered from the 1940's finally give us the chance to view the war as millions of people had to live it - in colour.